We’ve just lost a good friend to a brain tumour. He was only about 52, and we got to know him when he came to join my choir. He showed an immense talent for music composition, keyboard skills and a wonderful sense of humour through even the dark days. He also came over as very thoughtful, caring and non-complaining. He had looked forward to going to Ballachulish, Argyll in March to join in Evensong. His health had badly deteriorated, and we were very unsure about whether it was wise for him to go. If anything had happened while up there, the distance to a suitable hospital would have proved catastrophic, and we might have carried this in our mind for many a long year. My final opinion was sought, and I had to say YES, as I could never have forgiven myself if I has said NO. In the event, two members very kindly looked after him over the weekend and he thoroughly enjoyed it. It was his last major event outside his hospital and hospice. So, ‘CARPE DIEM’…..never let an opportunity of any kind go by….you may never get the chance again! I drove some 250 miles yesterday, with a friend, to visit a few chuches in Argyll, one of the loveliest areas of Scotland. It would have been, but when we started at 8.30, it was dull with lowering clouds. Even when crossing the Erskine Bridge about 9, we could just see the Clyde Estuary below (usually a wonderful, long-distant vista). Loch Lomond was wind-swept with few boats venturing out. Much of this road is new and wide, but when approaching Arrochar, we are suddenly into a tree-lined narrow twisting road which requires a lot of concentration in the driving. Puddles and fallen leaves were predominant here. Tyndrum, with the famous ‘Green Welly’ shop, led us north to mysterious Rannoch Moor, which would be a perfect setting for a prehistoric film with dinosaurs etc, rising from deep brackish water. Eventually, as the rain and wind worsened, we descended through the very narrow gorge to the infamous Glen of Weeping, Glencoe . To Scots (and in fact, the whole civilised world), it remains as a reminder of what one person, or government, can do to others….formally-accepted murder. The village of Glencoe sits in a marvellous setting, but seems uncomfortably close to the water level. Global warming and the rise in sea levels that it poses must be an obvious long term consideration for the inhabitants. But we were here to see two buildings in the neighbouring village of Ballachulish (famous for its slate quarry). A store house which was used as a very early Episcopal church, and the magnificent, (and very proud) St John’s Church which was built in 1842, and extended in 1888. It holds the Communion vessels which were reputedly used by the Jacobite troops, on the night before the fateful Battle of Culloden. The building is badly in need of repair and has a Restoration Fund. Our Choir, Angelus Singers http://www.angelussingers.wordpress.com (click the link) are helping to raise their profile by singing Choral Evensong there in March, so this visit was essential. It was of course freezing in the church as the rain continued to hammer down , but Highland hospitality in the local Tourist Information Office helped to warm us up. We then headed through Rob Roy country via Appin, to the Church of Scotland building dedicated to St Oran at Connell. It was a subject of a previous posting ‘A little Gem’, and was no-less-lovely this time (The Header picture is of the sanctuary). Although it is Church of Scotland, we have been tentatively asked to consider coming as a choir to sing the Anglican Service of Evensong for them! The day’s work complete, we headed back through wonderful countryside, just visible in the gathering gloom. Maybe it had been a grey day, weatherwise, but none-the-less I wouldn’t have swopped it (except, maybe for a sun-drenched beach and a glass of beer!!). A full Church and Choir Stalls! Sunday evening saw our Choir joining with other singers to sing the Office of Evensong, in St Aidan’s Church on the southern outskirts of Glasgow as they celebrated 85 years in existence. We had been helping in the arranging of the musical content of the Service along with the Rector and the Organist, but were not sure how many others would join us in the Choir stalls from the other invited churches, so did not know how many copies of the music would be required. The equivalent problems were being faced by those organising the printing of Service sheets and also the catering for our bodily needs afterwards as regards food. In the event we were all caught un-awares by the numbers turning up for the practice, the service itself, and the numbers of sticky buns required. Choir stalls, church and hall were all filled to overflowing!……you never see that mentioned in the newspapers! Some of you may already know of my great love of choral music, and our loyal band of Choristers who have worked together for some years now. So much is happening in that field that it needs its own outlet for information. How small is a congregation? 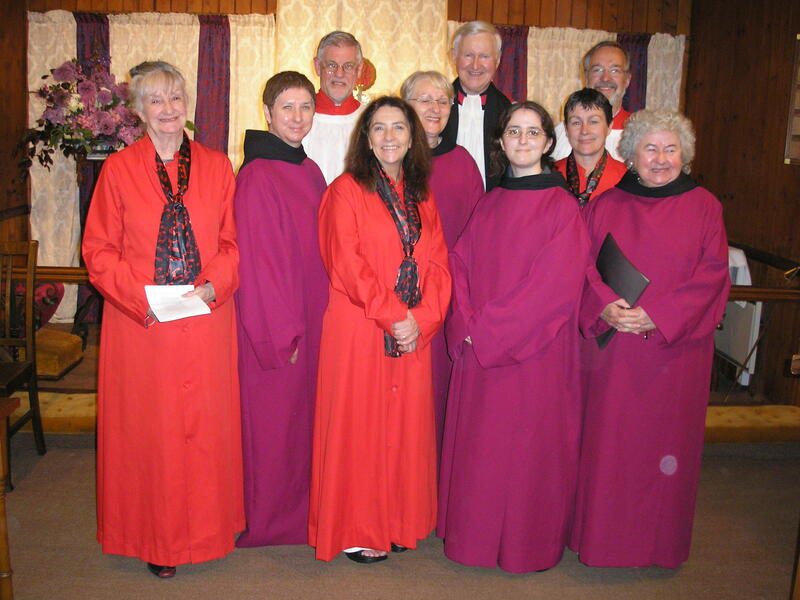 Part of our choir, Angelus, went to the little Episcopal church of St Fillan’s, in the Perthshire village of Killin. last Sunday. For those of you who do not follow my blog, we go to areas where they have no Church choir, and perhaps not even an organist, and sing the Service of Evensong. 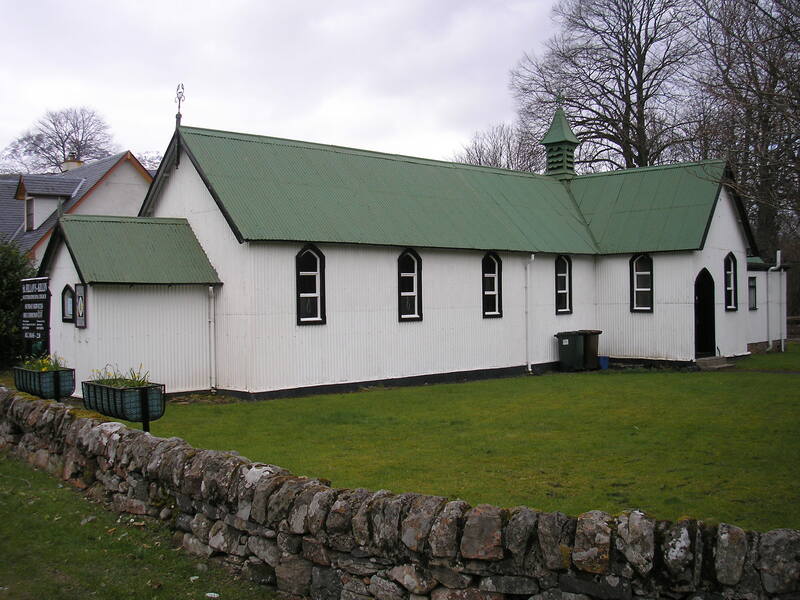 It is sometimes known as the ‘English Church’ , or the ‘tin church’ due to the external construction which is corrugated iron. However, inside it quite standard wood, and is warm and cosy. 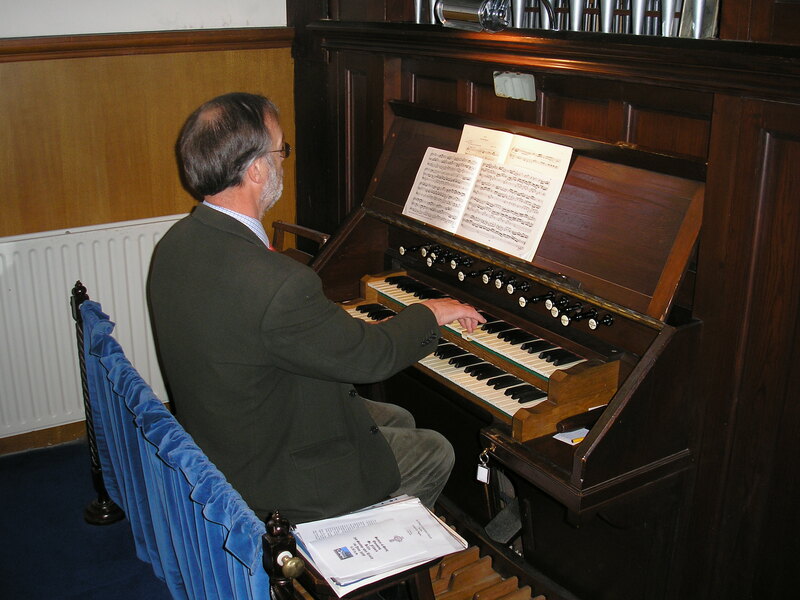 We were lucky on this occasion to have the services of a wonderful organist who brought notes from an instrument which you would not know existed…..many thanks….’keyboard expert’! Killin has only a small population outwith the holiday season, so the congregation of St Fillan’s is also relatively-small. When it was arranged, I did not realise that Evensong had not been held there since 1984! So it was really wonderful that members from all the other Churches, as well as visitors from the local caravan site were represented. Following our choir practice in another local church, we were treated to the usual ‘feed’. You have to be very careful not to eat TOO much, inviting tho’ it may be! It was all so tempting that it was difficult to resist….even knowing that we would be spending some time standing up and sitting down….and you can’t exactly dash out to the loo in the middle of a hymn! What had started as a dry, if cloudy, day turned into a rather soggy return journey, but nevertheless I hope that the 21 good people of Killin found it as inspiring as we did. Evensong at the Cathedral was special tonight…. the choir numbered 50, of present and past choristers who had gathered together to celebrate. The music was selected by Bernard Porter, a previous organist who was 80 years old this weekend, but certainly does not look it! He was a pleasure to sing under, with gentle criticism and much praise, a wonderful musical knowledge, but who used and practised his skill and craft with a wonderful under-stating. The youngest and most inexperienced chorister gained from being with him, and even those of who have sung for many years still came away knowing a little more about the works we were singing. Heavens….this seems terribly like an obituary! No, he is still alive and kicking, with an impish grin. I asked him what he will do for the next 20 years, and he said that it will all seem a bit ‘downhill from now on’. So different from those musicians are so full of themselves, with a puffed-out ego. So let me add my congratulations…well done Bernard!